Traffic lights: why yellow before green? Traffic lights around the world use the yellow light to warn people that it will soon turn to red, so that people can stop before. This is perfectly understandable. However, I found out that in some European countries the yellow light is also shown when going from red to green. Can somebody tell me what's the purpose of this? From my judgement, it is completely unnecessary. It's not like it is warning drivers of any danger. Do drivers need a sign that tells them to "prepare to go, but don't go yet"? And why would they need it? Do drivers need a sign that tells them to "prepare to go, but don't go yet"? Red and Amber— this combination of bulbs indicates that the lights are about to change to green, and gives drivers time to release their handbrake and prepare to drive off as soon as they are allowed to do so. This phase was first introduced in 1958. Note the part about releasing the hand brake. Most drivers seem to ignore this, but it is part of the UK driving test that you engage the brake while waiting at lights. It's also red+amber rather than just amber so that you know which way the light it going to change next should you only see it when it's in the transition state. If you see just amber then you know it's going to turn red imminently so you should be deciding whether it's safe to stop and preparing to stop. If you see red+amber then you know that it's going to turn green so you should slow down and be on the lookout for vehicles that may still be coming through the lights that are turning red. in some countries you are encouraged to turn off the engine on red (to reduce pollution), so the yellow before green tells you that you can turn it on again and prepare to go. From Green towards Red: Yellow alone. This way the two "modes" can be differentiated while maintaining the "change warning" behaviour. Efficiency could play a factor. For example: Assume two cars are stopped at different red lights. The first light goes directly from red to green. The other light goes from red to yellow to green. Also, the driver in front of the second light knows from experience how long the yellow light will last. Finally, both lights will turn green at exactly the same time. On average, which car will go first? How many times do people stop at red lights per day in the world? What is the world travel-time difference if the world used one method vs. the other? Now, being American, I see only red-green lights on a daily basis, and so I am used to them. Thus, I treat the cross-street's light turning red as my "yellow before green" cue, and know that it'll take about 3 seconds before I get the green. However, that makes my neck a bit sore, so maybe it is a chiropractor-conspiracy for why countries like mine do not do this. However, lousy jokes aside I'd opt for red-yellow-green scheme if I had the choice. It's a bit like 'Ready, STEADY, Go' - rather than 'Ready - Go'. It gives you a bit more time to get ready to go without feeling stressed about it. I've found driving in countries where it goes straight from red to green a bit more stressful. I suspect it reflects 'cultural characteristics (conformity / impatientness / etc)' of the country. To play devils advocate, the Red-Yellow > Green pattern of lights can be more dangerous than a plain Red > Green. With the Red > Green pattern, When you are approaching a red light, unless you know the intersection very well, you must make the assumption you are going to come to a full stop. With the Red-Yellow > Green pattern, you are given warning that the light is about to turn green, which in turn means that you can anticipate the green light and not brake as hard, or perhaps even realise you have time to speed up or not brake at all, which means you would reach the intersection sooner than you otherwise would. This is a problem if someone at the crossroad is impatient and runs the red light at the very last second. If a Red>Green scenario, the driver approaching the intersection will typically have a much lower speed, meaning that the impact of any accident is severely deceased, perhaps even avoided. If the approaching driver anticipated the green light, the impact would be much worse for both parties. As an anecdote, there was a Red-Yellow > Green set of lights near where I used to live in Melbourne, Australia. It was the last one left in the city and was left-over from the 1960's. They operated perfectly, but for some reason the council changed it to a Red > Green cycle in the early 2000's. Don't know why. And for the record, I do what everyone else seems to anyway which is watch the lights on the road to see when they go yellow, and would love the Red-Yellow > Green pattern myself. At holiday in Asia I've seen a countdown indicating how long the actual light keeps till next change. So you see how long it will be green and how long it will be red. I really love that idea. In Germany most people would act like Vettel, though. I'm living in germany and we do have the 3 step traffic lights everywhere. As for the first point, I completely disagree with ALoR's answer. It's simply wrong. Turning off the engine won't save petrol at all, not even on large crossroads. As a direct result of this it also doesn't reduce pollution. The main advantage is: You can start quicker. This may sound a bit silly, but it has a large effect on traffic. Im very curious the 3-state-traffic-light isn't there all around the world. You can spare time, gas and reduce traffic density. I think it's a fine addition to the red-green-traffic-light. Wether by design or accidentally, I think the yellow signal has a greater impact on pedestrians than drivers. In cities where lights go straight from red to green the crosswalks are full of stragglers when the signal changes. When there's a yellow signal in between drivers are already revving their engines and green really means go. From my personal, wholly unscientific observations, pedestrians quickly learn to respect and follow the crosswalk signals when they see that drivers have the yellow transition light. I think this is simply caused by most European cars using manual transmission, unlike cars in the U.S., which usually have automatic transmission. When stopping on a light with a manual transmission, you might shift into neutral for the wait. When the light turns yellow, you'd shift into first, and then when it turns green, you'd start going. With an automatic transmission, you simply hit the brake and then gas, so there's no need for the extra step (shift into first) like in manual transmission cars. A French friend of mine once answered my asking of this question by saying that their light durations tend to be quite long, so the norm is to switch your car's engine off while you wait. The amber warning is then used as an indication to start your engine again and prepare to disembark. Here in South Africa our standard light durations are relatively short, in the 15 to 30 second range, so it seems odd to us, but it could make sense if your light duration is 30 seconds and longer. 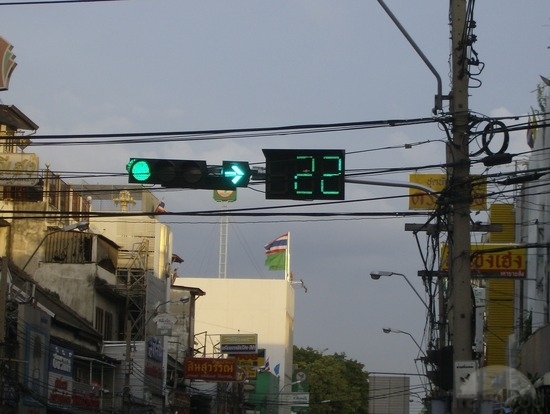 Modern city traffic lights often have a "green wave" system, where you can drive at the legal speed limit and always encounter green. If you are the first car in such a "wave" then the light will turn green just before you cross its line. Without a pre-green phase (in practice red-yellow) this doesn't work; you'd have to reduce speed in case the green wave has ended or been overruled. The purpose of the Red-to-Yellow-to-Green system is to increase throughput, due to FRESH ALASKA! If you don't know what that is, you shouldn't feel bad, as it's because I just reverse engineered it to fit my answer. I will setup and define both acronyms below. I will prove that in a Red-to-Yellow-to-Green system, more cars will be able to go through the light because more drivers will be prepared to go in according unison. Imagine an infinite number of cars waiting at a red light. We'll label the first car, "Car A", the second car, "Car B", and so on all the way to infinity. For some time X, Car B must wait for Car A to move, since it is not sure if Car A knows the light is green. X is normally a fraction of a second, but it must exist. If it did not exist, then Car B would step on the gas as soon as the light turned green, assuming Car A was immediately aware that the light was green. Again this carries on for the B-C relationship, the C-D relationship and on into infinity. You can guess that as we move toward infinity, all of these fractions of a second add up and the end result is a particular average number of cars making it through the light. Let's call this average the "Red-to-Green Average Throughput". FRESH, then contributes negatively to the Red-to-Green Average Throughput. Reset the infinite number of cars scenario with everything labeled the same way. The special relationship of pairs still exists, as Car B will still not step on the gas until it is sure that Car A is moving. Car A has a high likeliness to know that green is coming because of the yellow transition stated. Dependent on the first factor being a success, Car A is more likely to be alert and therefore prepared to move (Important if they are driving multi taskers). If the driver of Car A is an every day driver at this light, they are more likely to know the pre-red yellow duration due to familiarity of the yellow light time. For those in the real world Red-to-Green system, how many times have you been in the position of Car B when the light turns green, only to look ahead at Car A and notice they are head down looking at their cell phone or doing their makeup or eating a sandwich? They could be doing any number of things and have no time to prepare to drive. I would be willing to bet that this happens more often in the FRESH driven Red-to-Green system than the ALASKA driven Red-to-Yellow-to-Green system. This explains the purpose of the Red-to-Yellow-to-Green system as a means to move more cars through the light for any given time when compared to the Red-to-Green system. Traffic signals sequences often date back at least to the 1960s so it's often difficult to find relevant documentation and to know what the original intent was. Once a particular sequence is established in a country, it tends to stick and for good reasons also (e.g. cost of changing existing traffic lights, training/information need and driving errors created by any potential change, etc.) Even if it is tempting to consider the particular sequence you learned as the “correct” one, the value of consistency and stability should not be underestimated. Still, there is quite a lot of research on the effect of various signals on traffic, using either models of traffic flow or simulator studies (field studies and especially before-after studies seem somewhat rarer nowadays). The particular sequence you describe is known as “starting-amber” and it has been found to increase crossroad capacity but also to increase the number of people crossing while the light is red. After talking to my car racing brother, the joint theory is that this order of lights is leftovers from the manual transmission days. The yellow signal gives extra time to regain attention and switch into the first gear from neutral. Unlike automatic transmission, the process is multi-step and can result in a stalled engine if the steps aren't followed. In Pakistan, traffic lights generally go red>yellow>green and either green>yellow>red (or, more frequently now) green>red. The idea being a gradual slowing down and speeding up of traffic flow, plus (possibly only in our case) giving stragglers--vehicles and/or pedestrians--time to safely clear the crossing before the signal changes. Not the answer you're looking for? Browse other questions tagged physical signs or ask your own question. Why do Pedestrian Traffic Signals only play the audible crossing notification for only a short duration and not for the entire duration of crossing? Traffic light, no more shapes? Why print the text of a color name in that color? Is there a human advantage to painting heavy equipment (aka “baggers”) bright yellow? Why don't traffic lights include the time until the light goes red or goes green?